Macaroni is a spicy tastiest dish which simply do not like children but all likes.So I think if macaroni should be built in the house, we can make, depending on your taste.I provides a simple and easy way of making macaroni.I hope you enjoying to make a macaroni by using this method. Boil macaroni with 1 tbsp oil and after boiling wash it with cold water. Now take a pan ,add 3 tbsp oil and add onion, capsicum in a pan. Fry them until the onion became brown and capsicum became small soft. After fry them,add soya sauce,chili sauce,tomato sauce,pepper,garam masala,black pepper and salt. After this add a boil macaroni into this mixture or ingredients . Cook this at least 3 min on the simmer heat. Let off the gas it now. 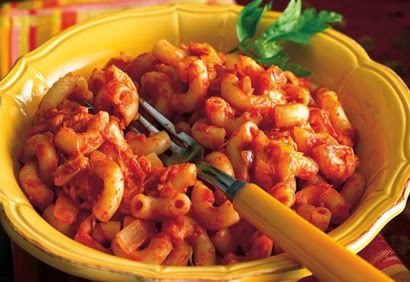 Add a macaroni into a bowl and garnish it with finely chopped coriander and serve with a tomato sauce. All Indian,South Indian and World wide HomeMade Recipes.Learn how to make delicious recipes at home.